The world of modern lighting can be very intimidating, especially when you’re a newcomer to the world of residential lighting improvements. Nebraskans looking to improve the value and enjoyability of their homes are quickly inundated with a plethora of lighting fixtures and styles to choose from. Even when you find the products you like, there is still a multitude of boxes that need to be checked off for a quality outcome. 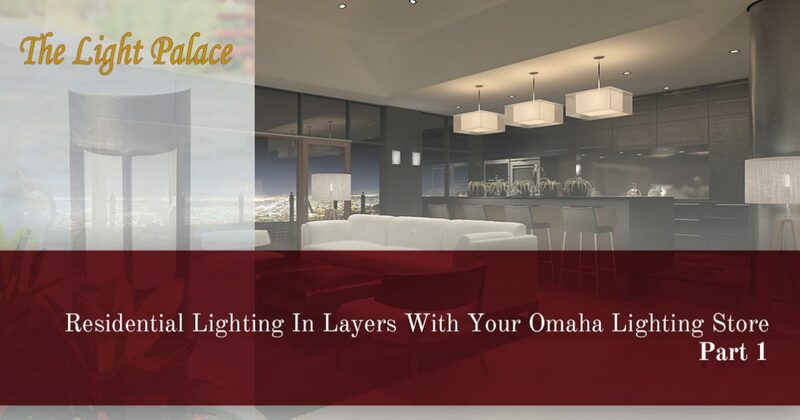 Layering, for example, is one aspect that includes the proper use of your home lighting fixtures in a format that creates optimal conditions for a wide variety of applications. Since 1953, The Light Palace has proudly served as your local lighting store in Omaha, providing amazing products and expert advice. We’re here to help you through every stage of your home lighting project, from designing the space to purchasing the perfect fixture. Today, we’ll discuss what layering is and tips to help improve the aesthetic qualities of your home’s interior. When done, be sure to stop by our expansive lighting showroom in Omaha or contact us today for assistance! As one of our previous blogs mentioned, layering is a useful technique for interior design, relying on color, texture, and pattern to create a balanced look. The lighting world relies on similar features, utilizing three types of lighting to properly layer your house. In essence, this practice is done to create the best effects for your space. If you need a workspace devoid of shadows, for example, it can prove beneficial to install task and ambient lighting in the correct places. Homeowners who are opting to create more interest and drama in their home with a treasured piece of artwork can make the most of the space by introducing different levels of accent lighting to truly enrich the features. How you illuminate your space depends on a number of factors, and it’s best to plan ahead to avoid any mishaps. The downlights in your home are essential for casting many layers of lighting, but doing so indiscriminately can create a room that is uniform and boring. Tactically placing your new light fixtures at different heights for different purposes in groups throughout the room can take the design quality to the next level. Remember to focus on grouping your home lighting with smaller circuits, as placing dozens of fixtures on one circuit can create serious challenges! Providing the indoor lighting for larger rooms such as your kitchen or living room can be a challenge. These bigger spaces are often built to be used for multiple purposes, such as cooking in your kitchen while your child studies for a test at the table. By spreading out your indoor lighting fixtures, you’re able to do more to personalize each space individually. Doing this can create functional areas that maximize versatility and convenience. If you are struggling to find the right products for your large kitchen’s lighting needs, our experts here at The Light Palace can help! Layering your home lighting will help to create a scheme that covers your house with quality and safety. Next time, we’ll continue this subject by highlighting a few more tips that may prove useful in brightening up your home. If you’re looking for a local lighting store in Omaha, you’ve come to the right place! The Light Palace is here to serve as your source for the best modern lighting products and advice in the industry. After decades in the business, we’re confident that we can provide the best solutions for your needs. Contact us today or stop by our lighting showroom to begin planning for your home!